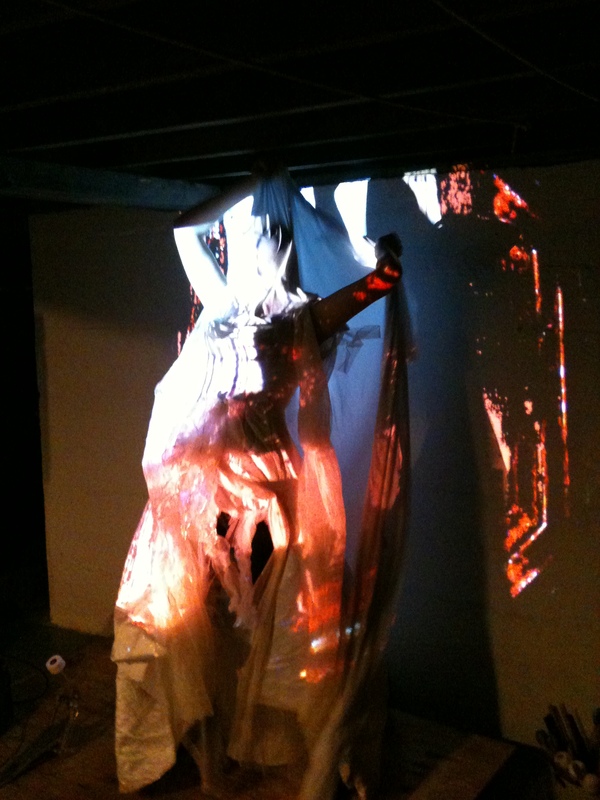 Dancer/Performance Artist, Jamie Lynn Smith testing out her costume with the video projections at a Camera Lucida rehearsal. December, 2012. In a previous post I talked about one of my latest projects, a Community New Music group called the Mothership Ensemble. This post is about another new project I also co-founded with Roxell Karr. We call ourselves Camera Lucida, and it’s an artistic collaboration incorporating live interactive video and music for dancers and movement artists. One of the big inspirations motivating us in doing this is by an Australian Modern/Experimental Dance troupe, Chunky Move–especially a piece they do with interactive video, called Mortal Engine. While we haven’t gotten to the level of sophistication of what Chunky Move do, we are having a blast exploring the genre and live performance software (mainly Isadora) and hardware. While I don’t deal specifically with the video side, both Roxell and I constantly talk about ideas and experiment with them as he gets new equipment. Since we work with dancers and movement artists we also do alot of brainstroming with them before events (or after, as the case may be).